REUTERS/Bobby YipWorkers are seen inside a Foxconn factory in the township of Longhua in the southern Guangdong province May 26, 2010. Foxconn Technology Group is building a factory exclusively to make screens for Apple products, reports Bloomberg News. 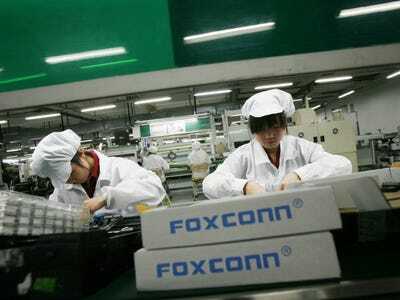 The factory will be located in southern Taiwan and follows an “urgent request” from Apple, according to a Foxconn spokesperson quoted by Bloomberg. The news comes in the wake of the bankruptcy of GTAT, which had been talking to Apple about building sapphire displays for the iPhone 6. That deal fell through. Apple was already Foxconn’s largest customer, and Foxconn has a couple of factories dedicated to assembling Apple products, but this is the first one dedicated to building a particular part. Having an exclusive factory for displays reduces the likelihood of a supply shortage, which has been a problem in the past. The plant will reportedly cost $US2.6 billion and employ 2,300 people. It should be up and running by the end of 2015.